Ready for another little summer project? I have been chasing a lot of dreams in my life. Most have been elusive, but I have help in catching them now. I made a doily dream catcher. A summer and beach dream catcher, because my dreams are all about the good life on the beach. This was a fun and therapeutic project to do. A while ago I saw a store that had giant doily dream catchers in the shop window. I loved them and took pictures. Than I went to Pinterest and saw that many people before me had made doily dream catchers. I loved some of them to pieces, some of them were not exactly my style, but all of them increased my own hunger for a doily dream catcher. And well I have doilies……. First order of business go through my stash and find a round doily that would work. This was the most time-consuming part of the project. Mainly because my stash is huge ( I keep finding and buying them at flea markets) and I got totally distracted admiring and playing with all that handmade loveliness. But I pressed on and selected my favorite doily. Next step prepare the ring. I used a basic crochet stitch to cover the ring. Another part of this project that was a bit time consuming, but not very hard to do and it could be done while watching a murder mystery. Adding shells, and feathers and beads. I improvised a bit and came up with this. And then I had to find a place for her. That wasn’t that easy actually. I know it would make sense to hang a dream catcher in the bedroom. But that would mean I wouldn’t see her that often. So guess where she ended up.. 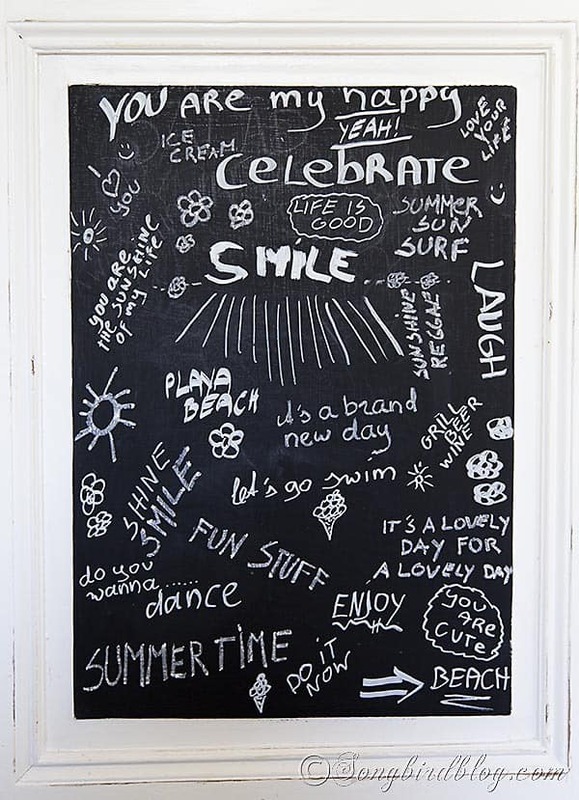 I turned our chalk board-message-grocery list-kitchen-door into a summer inspiration hub. The star is of course my dream catcher. But I went a bit wild with the chalk too. Now granted, my skills at drawing and chalk writing have not progressed beyond first grade primary school level. But who cares, it makes me smile. So here is my interpreting of the beach I dream about…. Sun, sand, palm treas, and sipping fresh drinks in the shade…..
a dream worth dreaming, me think….. This door in my kitchen is straight across from the back entrance, the entrance we use the most. So this is one of the first thinks I see when I walk into my home. And I love that it reminds me instantly to have fun and catch a few dreams…..
<<<< Easy DIY Beach House Decor Project. I aaaadddddoooorrrreeeee this so much! How did you attach the doily to the ring, any fancy method? This is so beautiful! Pinning! what a sweet idea– so creative!! I am impressed! I love the idea and it turned out wonderful! What a wonderful idea! It goes perfectly with the door, too. I love your style, just for the record. This is sweet and wonderful! I LOVE it so much! I’m so out of it. I’ve only seen true dream catchers my Dad would get from Missions located on the reservations. Their plea for funding would include a small dream catcher. Dad always gave to the Indians. The name they call themselves. And the dream catchers became a little gift for all the grandkids over time. Now you say this is all over Pinterest and I’m thinking YOU are the most creative person who can work hard plus make yummy candy, And a fancy box to put it in AND now use wire of some kind and crotchet and hand stitch the doily on AND string more shells which means drilling holes in them AND adding fluffy white feathers. Then displaying the dream catcher in the best place–your first site at home. I like your chalkboard writing. So fun. So real. Something to glance and think about for the day. I love the entire creative piece. Oh! Remember your had to have blue Mason jars??? What did you ever do with them?? Did I miss the post ? ?